I am ashamed to admit that I never heard of Malcolm X in high school. Dr.King was only one of the only black Americans I remember being discussed in high school beyond the context of slavery. This is a serious omission in the public school system which I am now a part of. I wish you had been one of my teachers, Denise. Thanks, Jeff—that is too kind. I really like the fact it took hip hop to bring a great leader into mainstream consciousness! 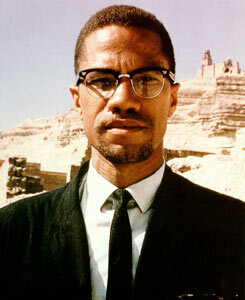 Now we all know Malcolm X: even his glasses are iconic. Agreed…in my defense I was a Public Enemy and KRS-One fan. Have you listened to Lowkey and Immortal Technique? Don’t know the work but understand it’s in the same tradition and will check it, thanks. Of the new school, I like Jasiri X and Cambio: More music that brings to light some of what’s left out of textbooks.